Does anyone remember playing a game of marbles? 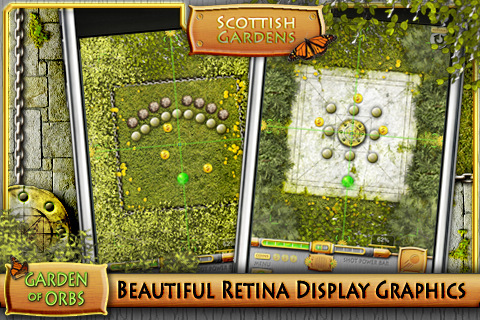 Garden of Orbs by Synthesis Design Solutions is a game for the iPod Touch, iPhone, and iPad. Like a game of marbles, Garden of Orbs has the player figure out ways to knock orbs out of bounds. This game features four locations to play including Japan and France. You can also download more gardens from different parts of the world to play. There is a leaderboard so you can see how well you did against other players. To play the game, you use a targeting reticule and find a place to launch the green orb with enough power to knock out the orbs. Press the shoot button to roll your orb. When an orb fades away, it means an orb is out of bounds. Get all the orbs out and collect coins to gain bonus points. Gameplay in Garden of Orbs is simple in execution but difficult when it comes to fulfilling objectives. Sometimes you’ll have to knock twelve orbs out of a ring but you’ll only have three chances. When a level ends, the results screen shows you how many lives and shots you used and the how much time it took to finish the level. It also rates your skill level from an amateur to a pro. The soundtrack is interesting since it features music from various regions of the world. You hear music from Japan, Scotland, Sonora (a state in Mexico), and France. The sound effects are catchy such as your orb breaking when going out of bounds, a “clink” when hitting an orb, and chirping birds. You can choose to turn the music and sound effects off, but why would you since it adds to the charm of the game and makes it feel more relaxing that way. Graphics are extremely polished and the visuals have gorgeous colors. The environments in the stages are lush and vibrant. In the Japanese garden, a level might have a bridge, cherry blossoms, stones, etc. While in Sonora, there are cacti (can break your orb), murals, and clay pots. Garden of Orbs is sells for $1.99 in the App Store. Each stage takes little time to complete. The replay value is great since you can revisit a stage to complete it in less time, not losing a life, and using less shots. It features free-play, shot, and time modes. While the there is no multiplayer mode, you can compete to see if one player has finished a stage faster and better than another. I personally did not enjoy this game too much since it feels repetitive after a while, and the music sounds a bit stereotypical. Hopefully other people will enjoy this game more. 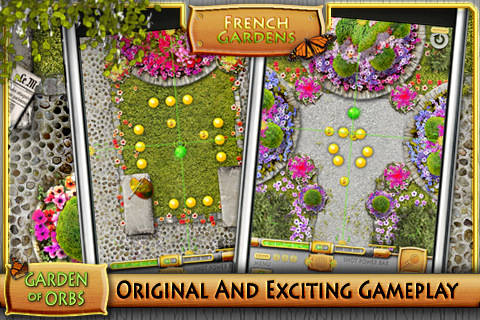 AppSafari review of Garden of Orbs was written by Tony Lau on February 16th, 2011 and categorized under App Store, Games, Puzzler. Page viewed 5479 times, 3 so far today. Need help on using these apps? Please read the Help Page.